Throw yourself wall to wall parkour-style! itch.io Community » General » General Discussion · Posted in I want to play your games! Hope you give it a try and enjoy it. Feedback would be much appreciated too! Nope, no following. I posted on Release Announcement and the post got picked up by leafo - I guess I lucked out! Itch.io guidelines advise to give that all important announcement post some love. Back then I made a point of showcasing the game by having a cool looking GIF - something with a bang, must have been catchy enough! I wrote a few devblogs on my website that cover the journey of Holey Suit on both itch.io and Gamejolt from a marketing perspective, if you fancy a longer read! As your game Landr, the spike is very much down to being listed in the fresh section on the front page for a bit. The downward trend correlates with the game gradually disappearing from the front page. It's interesting to compare the trend with my previous game Holey Suit, which I released over a year ago. That time round I got a feature spot, so the effect is a bit more prolonged as it took a while for the game to completely move off the home page. Something further I can share, is how Holey Suit did since its release - over a year! Basically it had a good run, and I was lucky to get that feature spot. However don't expect your game to stay in the limelight very long! Past the initial boost, being featured or listed in new/fresh, seldom few users will stumble across your title. Obscurity is the norm. Twitter promotion has always worked moderately, but the impact is negligible compared to a feature / appearing on the front page. Truth is there are a lot of titles released each day, so it's a battle to get up the pecking order - but it definitely yields the most impact. Otherwise itch.io has a dedicated announcement section: https://itch.io/board/10022/release-announcements - the moderators on itch check these posts regularly and if you luck out, you can get a feature spot. From my experience being on the front page has the most definite impact, so make sure you polish your announcement! I tend to follow the guidelines to the letter with description, GIF, screenshots etc. Here's an example with my latest game. Dev logs work too, if you make a major update or launch post. Check out that post from the itch creators: https://itch.io/updates/devlogs-post-types-enhanced-browsing-and-more. Check out the "A New System For Updated Games" section. Definitely worth keeping in mind! itch.io Community » Game Development » Release Announcements · Created a new topic Jump Jolt - HTML5 Release! 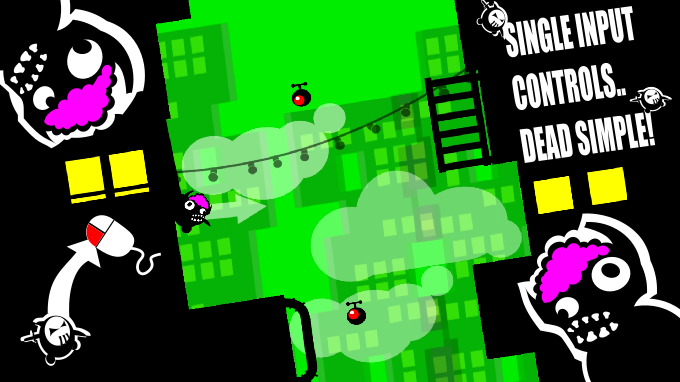 Just to let y'all know my game Jump Jolt is now playable in-browser thanks to the might of HTML5! 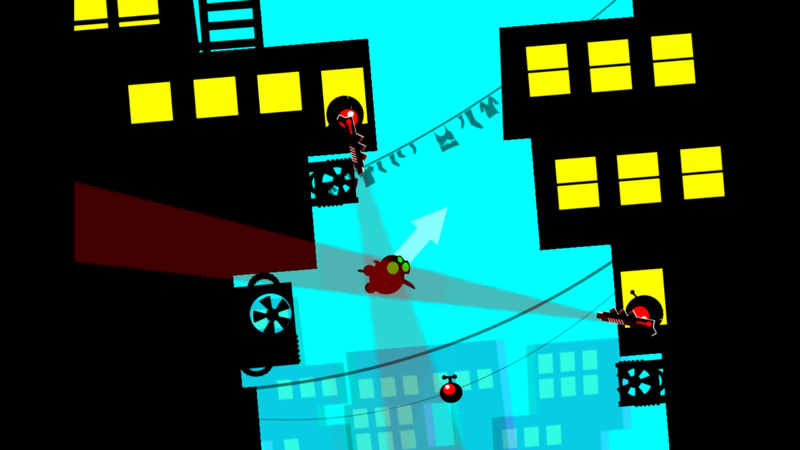 Jump Jolt is a frantic wall-jumping / parkour game, where your hero (a sticky vigilante covered in duck tape) climbs up buildings by throwing himself from wall to wall to save the city from a robotic invasion! 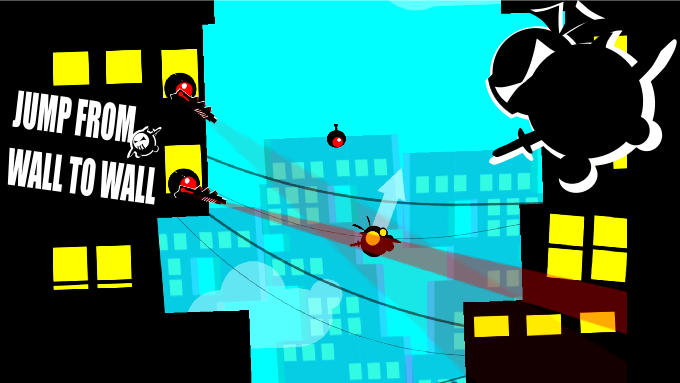 Avoid deadly flying bombs and sniper lasers, and make it to the top to sound the alarm! The game humbly originates from the Shenanijam 2018, where it ranked #5! A few month later, a polished version of the game with better graphics & balance was released. The game was also pushed out to Android! 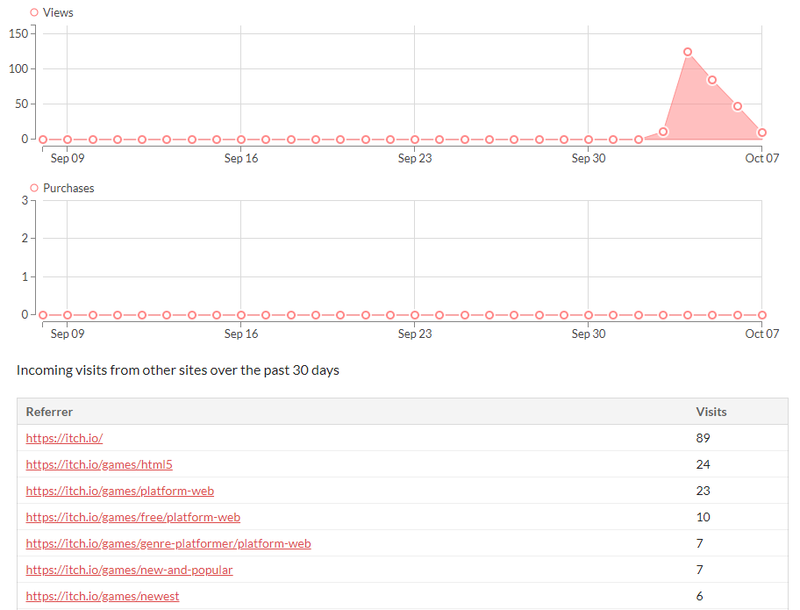 One thing was still missing though: reach as large an audience as possible here on itch.io. Hence moving the game to HTML5, which makes the game accessible through a range of devices and computers, as well as being directly playable through a browser - no install required! That's about it! 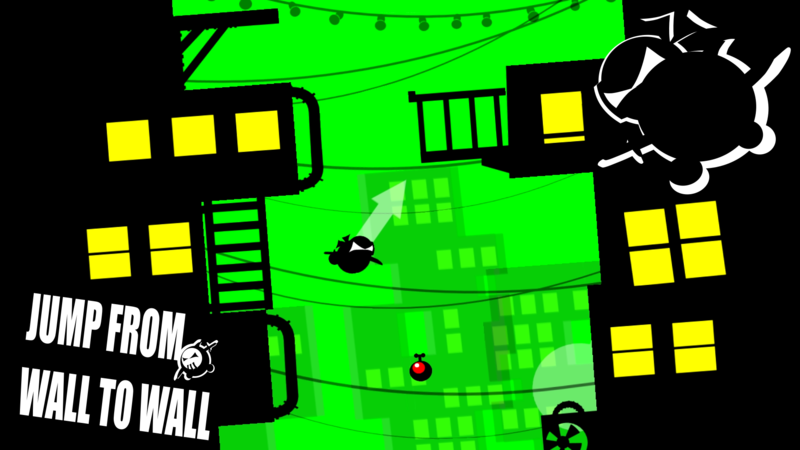 Hope you give it a go & enjoy Jump Jolt!! itch.io Community » itch.io » Questions, Ideas & Feedback · Replied to leafo in Reset the Published date on changing submission to "Released" status? Oh right, I visibly did a poor job with my Major Update post last week then! Do "Tutorials" posts also contribute to the freshness of your games? I'm working on a Thumbnail/GIF tutorial at the moment. Just curious if that contributes in any way towards creeping up the New & Popular page. Obviously that'd be a nice incentive for devs that want to share tricks with the community whilst raising awareness of their games. itch.io Community » Game Development » Release Announcements · Posted in Jump Jolt - Jump, Die, Repeat!!! 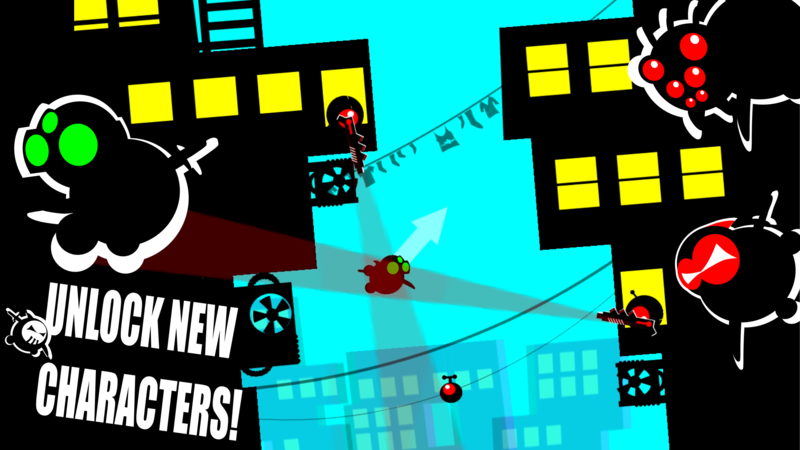 I forget to mention - JumpJolt is also available on the Google Play Store! Link on the game page! itch.io Community » itch.io » Questions, Ideas & Feedback · Created a new topic Reset the Published date on changing submission to "Released" status? Quick suggestion: would it be possible to reset the Published date of a submission when changing from "In Development" or "Prototype" to "Released"? After polishing off one of my previous jam entries and proudly re-releasing the game again yesterday... Flip, flop. No views or downloads boost. I realised it is not benefiting from the presence new entries get, being propelled to the top of the New Releases page. I suppose it's always possible to delete the submission and resubmit the game afresh (I have seen others blatantly do it), but since the game originated from a jam I'm keen to keep that link alive (it did pretty well and ranked #5 which I'm rather proud of). That and of course any previous comments posted on the game page etc. Outside of a jam entry context, I guess the same would apply to a game that has been Under Development for a while, and finally hits that stage where it's past beta and officially ready. Just a though! Any little helps.. I thought I'd add my two-cents as I also recently had to fill in the tax questionnaire (I decided to start accepting donations). I am individual from the UK, so obviously this does not address the German side of things, but might be useful to anyone going through these gruelling questions! Same comment on the ITIN as pointed out by Wend1go. TIN stands for Tax Identification Number and the questionnaire accepts your local country tax code. In my case in the UK, this was my UTR (Unique Tax Reference). Re-declaring income, I believe things work the sort of the same in the UK as Germany. Assuming you are employed and game making is a hobby, there is a tax exemption for additional income made from side activities. Best to check with an actual accountant, but anything under a thousand pound should be tax-free. In my case I actually created a LLC with its own UTR. I am self-employed and planning to have game development as a secondary income stream, so this made more sense for my situation (but was a bit more complex to setup!). On a side note, I'd encourage anyone planning to actually selling game to set up a LLC, as it protects you as an individual. Chances are very low, but some AAA company could decide to sue you for copyright infringement or whatnot (happened to notch in the early days of Mojang), so it's better they sue your company - not you! itch.io Community » Game Development » Release Announcements · Created a new topic Jump Jolt - Jump, Die, Repeat!!! I just re-released a previous Jam entry. Off goes StickAss (rated #5 for the Shenanijam 2018) - now introducing polished & shiny Jump Jolt! The game is still all about wall jumping parkour style. You play a sticky vigilante covered in duck tape throwing himself from wall to wall. 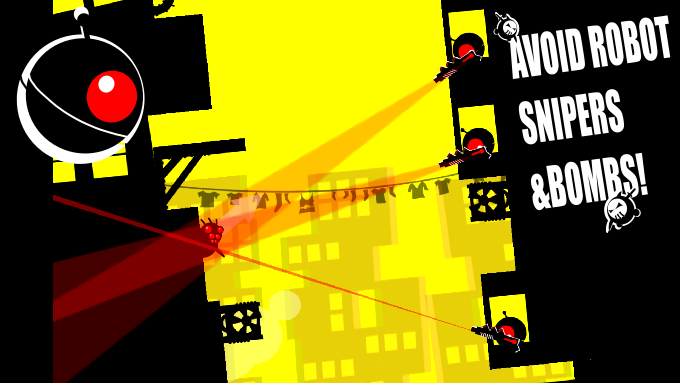 Avoid robot bombs and lasers and make it to floor 200 to sound the alarm! Game was also freshly released on Google Play, link on the itch.io page! Enjoy! Thanks, much appreciated! Yup there are a few bugs & the game needs a bit of extra love, I'm planning to work a bit more on it after the jam. Bat outfit should come up randomly, but the calculation is a bit ropy & random so it might take a few times before it appears! Thanks! Yup I'm debating porting to Android, although I tested on a tablet and it's a bit fiddly with touch control. Need to give it some more thought! If you haven't watched it yet, this is my go-to video for any platformer/shooter design - definitely recommended! Thanks! Once you reach floor 50 you get access to yellow/blue/green backgrounds for a bit more variety. I'm currently working to see if I can get this to work nicely on touchscreen. If I can pull this off I' m definitely thinking of an Android version! Cool concept! Love them' physics games! Nice look & feel! The menus are awesome - very polished game! Nice up close camera, gives the game a good claustrophobic feel!!! Haha, you got to defend that bun!!! Theme of the game reminds me of BS' Burger Tower Defence, minus bears, plus cheese!!! Haha, so much space debris drifting around earth! What software was used for the art? Love it, reminds me of BS' very own Eric Hibbeler style! Thanks, it came really naturally after I decided to go for the 3-bit colour palette achievement! 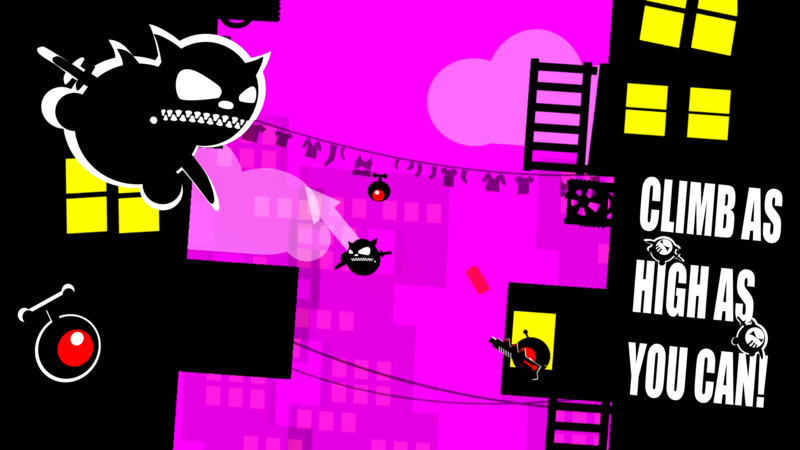 Closest game inspiration is probably the Swindle, which has much better graphics but similar black/mono-chromatic atmosphere and wall jumping. Nice work doing this all just over 24hrs!